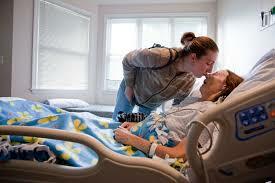 At Snowline Hospice, I work with people who bravely say good-bye. I work with people who struggle to say good-bye through their tears. I have people who can’t say good-bye because they are in denial that their loved one is dying. And unfortunately, I have a few, a very few, who are very glad to say good-bye. Being in denial is a defense mechanism. 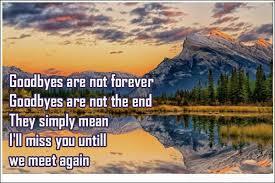 If denial is helping a loved one cope with a death, then that is okay, just as long as they do not have later regret. We help families during this time by giving them all the information they need, if they are ready to hear it and to read it. The difficulty of saying good-bye increases as the level of attachment that exists between the two people increases. For someone we barely know, we may be sad that they are gone, but little to no tears are shed. For a beloved family member, the grief may seem unbearable. We grieve losses, great and small. The degree of grief is proportional to the degree of attachment. In English, saying good-bye seems more permanent than saying something like “so long.” Some people don’t like saying good-bye. We might say, “See you later,” which implies a temporary parting and a commitment to reconnect that good-bye does not impart. Poet Les Murray writes, “People can’t say goodbye anymore. They say last hellos. “Take, for instance, a recent experience Murray had with some good friends. They had packed the last of their belongings for a cross-country move and showed up at (his) door before hitting the road. (He) tried to make small talk, awkwardly fending off the inevitable parting. Finally, they gave (him) a hug, and (Murray) blurted out, ‘We’ll have to get together again this fall. Maybe I can make a road trip down to see you.’ A last hello is what (he) was saying, not a goodbye. (Murray) couldn’t bring (himself) to say the latter. When Jesus said good-bye to his disciples, he chose to do so in the form of a prayer, though, I guess, he could have said, “See ya later.” John 17 is the prayer Jesus gives his friends. Jesus begins that prayer by acknowledging that his time has come. Jesus asks that he may be glorified so that God may be glorified. It is so easy to gloss over the beginning of this prayer and that is what I prefer to do. However, the question is still begged: If Jesus is God, who is he praying to? Jesus is very explicit in John’s gospel that he and the Father are one. If they are one, does Jesus really need to pray? If they are one, to whom is Jesus praying? I do not have definitive answer, because my brain is too small to understand God. But if God is a being who transcends time and space, then being in two places at once should be very easy. One being, I take myself as an example, can have competing and even contradictory ideas at once. That’s my best shot of explaining this part of the Trinity in John 17. John thought the content of this prayer was important enough to share with other Christians and Jesus seemingly wants the disciples to know what he is communicating. Jesus has authority over all people. Jesus gives eternal life to all God gave him. Eternal life is knowing God, at least as much as we are capable of knowing God. Again, I think our brains are too small to understand the whole nature of God. Jesus also implies that though God is aware of other Gods, knowing God also means excluding the others. This is likely a shot at the Greco-Roman gods. Knowing God also has Jesus as part of the package. Jesus also acknowledges that he is the messiah. Jesus’ glorification is not just the cross. Jesus’ glorification is his ministry of teaching, preaching, and performing miracles. Just one quick note: Jesus’ miracles were not done as a sideshow. Jesus miracles were done to show people that there is something greater than what they know. Jesus’ miracles were about bringing wholeness to a broken world. Jesus will be glorified again as he was before he was born in human form, as Jesus was before creation. God’s name was made known to the disciples by Jesus. I don’t know how Jesus means this. If it was literal, there are issues. If it was meant figuratively, then it may just mean that they have an idea of who God is. They certainly should know God, because they know Jesus. The literal problem is that God’s name is to never be said in Judaism. In the ancient world to know the name of something or someone, gives power over the thing or person. That’s the problem. We can never presume to have power over God. I think Jesus was speaking, not of power, but of intimacy. Traveling around Galilee and Judea for roughly three years would produce an intimacy among Jesus and the disciples. They knew Jesus quite well. And since they knew Jesus, they knew God. Jesus says that God gave them to Jesus. Jesus did choose some disciples and others volunteered. Jesus is satisfied that they were faithful. Of course, though, there was that one guy. At this point in John’s gospel, Judas was long gone. The disciples understand that the words that Jesus gave them were from God. They know that Jesus came from God. Jesus is interceding for them. All that God has is Jesus’ and all that Jesus has is God’s. Jesus is glorified by God. Jesus is glorified by his ministry. Jesus is also glorified by the disciples. Jesus has already separated himself from the world before he is even arrested. Though Jesus has left the world, the disciples remain. Jesus asks that the disciples be protected in God’s name. The disciples are to be as one. Jesus’ message cannot be divided and the spreading of Jesus’ word cannot be divided. The disciples are to be united. The example of their unity is the object of Jesus’ prayer and of Jesus himself. Jesus and God are not separate. The disciples are not to be separate. The amazing part of this prayer came to fruition several years later. A rabbi was arresting and overseeing the execution of Christians. On the road to Damascus, Saul was struck down and blinded by Jesus. Saul was made to see that Jesus was son of God and he spread Jesus’ message throughout the Roman Empire even though he never personally knew Jesus. Paul said good-bye to a life of hate and said hello to love. It is love that makes saying good-bye so hard. Maybe saying a good-bye prayer isn’t such a bad idea. Jesus gave us the structure of the prayer. In God, love abides with us. As Jesus’ love of the disciples abides, it also abides with us. As Christians, good-bye is never a permanent separation. This is Easter. This is resurrection. We will, one day, be in a place where love abounds and good-bye has no meaning. Love may cause grief, but love abides forever. This entry was posted in Death and Dying, Hope, Jesus, love and tagged Christianity, Easter, God, Hope, hospice, Jesus, love, resurrection, Snowline Hospice. Bookmark the permalink.